Last time we informed, abut pre-orders for the new flagship Nokia 930 that appeared in Germany and France, now it comes to Italy. The smartphone is available in the Microsoft online stor with a prcie of 599 euro. This price doesn't look to attractive taking into consideretaion, that the phone costs 50 euro more than in Germany for example. 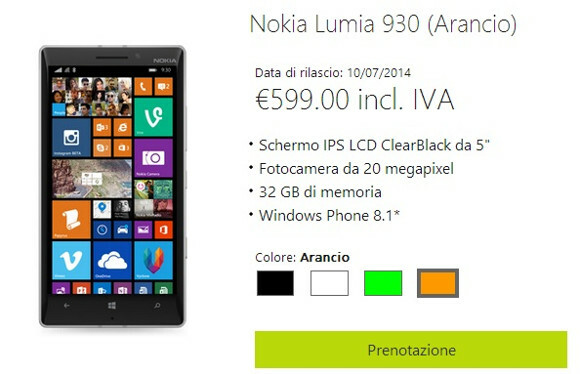 Lumia 930 will be available on July 10, and You can buy it in four colors: black, white, green and orange. The 930 model is the first one in the Windows Phone 8.1 line up, but the premiere takes a really long time, and many clients might get nervous by this fact. Our company sim-unlock.net offers special unlock codes to remove sim lock blockades from all Nokia models. Thanks to this unlock every client will be able to use his phone with every network he wish.